Here’s a summary of research in humans. Studies that show antioxidant effects but no change in disease or a clinical condition were omitted. 20 healthy adult women had facial wrinkling. 41% of the women preferred Vitaphenol, while 1 woman favored placebo. The responses to ellagic acid-rich pomegranate extract (200 vs. 100 vs. 0 mg/day) were compared during 4 weeks of treatment. The dietary supplement called Radical Fruits contains pomegranate, among other fruits. 44 adult men were treated with Radical Fruits or placebo for 4 weeks. There were significant reductions in total cholesterol from 280 to 250 mg/dL and in LDL (bad) cholesterol from 195 to 169 mg/dL with Radical Fruits. 22 patients drank 40 grams/day of concentrated pomegranate juice for 8 weeks. Compared to 8 weeks before treatment, taking pomegranate was associated with significant reductions in total cholesterol, LDL cholesterol, LDL/HDL (good) cholesterol ratio, and total/HDL cholesterol ratio. 48 men with rising PSA (prostate specific antigen) after surgery or radiotherapy for prostate cancer were studied. They drank 8 ounces of pomegranate juice daily. The time it took for the PSA value to double significantly increased with pomegranate. The authors tell us there’s no proof that pomegranate is a good substitute for traditional therapy that eliminates the disease. Prostate cancer patients should tell their doctor if they drink pomegranate juice. 30 patients with COPD (chronic obstructive lung disease) were randomly assigned to either 400 mL of pomegranate juice daily or placebo for 5 weeks. 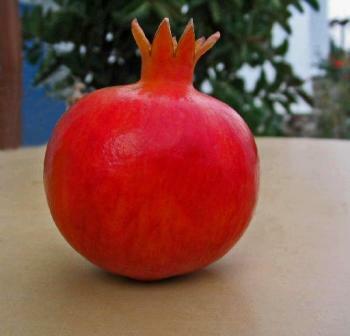 There was no benefit from pomegranate. 45 patients with ischemic heart disease drank pomegranate juice or placebo. Stress-induced ischemia significantly decreased with pomegranate vs. placebo. There were no changes in medications, diabetes control (blood sugar, A1c), weight, or blood pressure. 53 men with mild to moderate erectile dysfunction tested pomegranate juice vs. placebo in random order. No significant difference between treatments. 60 patients with denture stomatitis were treated with an antifungal drug (miconazole) or a gel containing Punica granatum 3 times daily for 15 days. Both treatment gave similar results. 15 patients who completed conventional periodontal therapy participated. Biodegradable chips containing Centella asiatica and Punica granatum extracts (pomegranate) were implanted between the gums and teeth. Over 3 to 6 months there were significantly improved clinical signs of chronic periodontitis (inflammation) with pomegranate vs. placebo. The sedative, midazolam (Versed) solution tastes bad. 75 anxious children had to be sedated before dental surgery. Adding pomegranate to the midazolam solution didn’t make it easier for kids to take it. And didn’t improve the sedation caused by midazolam. The results are a mile wide, but an inch deep. POM Wonderful states that it has spent $30 million on research. If you were responsible for the next million dollars of research, where would you spend the money? I’m most impressed with the cholesterol data. The prostate data concern me because some people might get the impression that it’s a substitute for allopathic treatment. And there’s nothing to suggest that pomegranate can “cheat death,” which, you may remember, was the original subject of this post. This entry was posted on Sunday, July 11th, 2010 at 7:40 PM	and is filed under Cholesterol/Lipids, COPD, Diabetes Mellitus, Heart Disease, Infection, Pomegranate, Prostate. You can follow any responses to this entry through the RSS 2.0 feed. You can leave a response, or trackback from your own site.